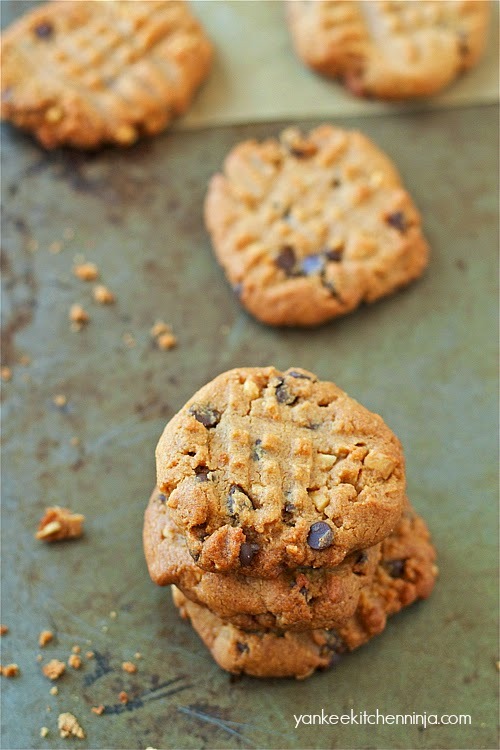 It's easy to whip up a batch of these gluten-free peanut butter chocolate chip cookies, even if you only have 20 minutes! I think these peanut butter chocolate chip cookies are my new go-to cookie recipe. Mr. Ninj says they taste like a smooshed, baked peanut butter cup. I firmly believe that everyone needs a quick and easy, go-to cookie recipe, whether for whipping up a late-day treat for yourself or baking some last-minute goodies for the school party your kid forgot to mention until the night before -- and every other situation in between. The key is that the cookies have to be wicked good but also wicked easy. These peanut butter chocolate chip cookies are both (I mean, come on: "smooshed, baked peanut butter cup" -- you know it's gonna be good). I can't tell you how many times I have already made this recipe over the past few months. It's a cray cray number and yet we're still not sick of them. Now that's a good cookie! Oh yeah, and did I mention they're gluten-free? And not in a substitute-gluten-free-flour-for-regular-flour way -- they are truly grain-free, so you don't even have to worry about the recipient's gluten sensitivity if you gift them to someone. Speaking of gifting these peanut butter chocolate chip cookies, that's just what I did with the last batch. This is my first month participating in a little blogger group called The Leftovers Club. It's a fun idea -- each month, each of us in the group does a one-on-one food swap with another food blogger, and then we all share our recipes with each other -- and with you -- on the same day. But back to the recipe. Let's talk easy: how does one bowl sound for making these bad boys? And no powered equipment is required other than your powerhouse arm for stirring. One more bonus: the recipe makes exactly 20 cookies, which can be baked on one single tray in only 10 minutes, so there's no guess work involved in how big a scoop of batter you should use for each cookie. Enjoy the cookies -- and be sure to check out all the other delicious recipes from the entire Leftovers Club below. In a bowl, whisk together the salt and egg white until nice and frothy. Add all the remaining ingredients and stir until combined (a rubber spatula is great for this) . Drop the dough into 20 portions on a parchment-lined baking sheet. Use a fork, first vertically then horizontally, to flatten each cookie, making a crisscross pattern on top. Bake for 10-11 minutes or until edges are just browned. Cool completely on a wire rack. 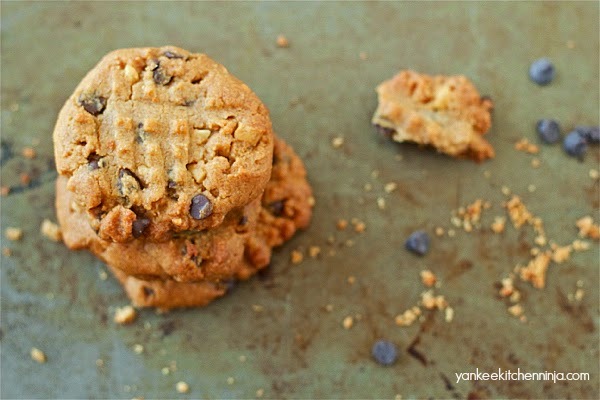 A smooched, baked peanut butter cup sounds like the perfect flavor cookie to me! These look so yummy! I just love cookies. Thank you -- hope you give them a try! Thanks, Elizabeth -- it's so much fun! Yummmm!!! These sound amazing, and GF is even better; I'm always on the lookout GF desserts especially. I also found a great GF macaroon recipe at real(ly) simple that's, well, really simple. And also quite delicious. does it have to be natural pb? I happen to have some unnatural that nobody's eating and it would be nice to use it up. but I do have the natural kind, so it still won't require a trip to the store. Ha cha cha! The consistency might be a bit different, I think. I love things that are naturally *insert food problem here* free. Makes it so much easier! HA HA!! I agree, Elizabeth. Yum, yum, yum! Great minds think alike. My recipe was peanut butter and chocolate too. These sound delish. Wow, I can't believe there is no sort of flour in this at all! They look stunning Ninj!!! And smooshed PB Cup?! How can they not be awesome!!! YUM. 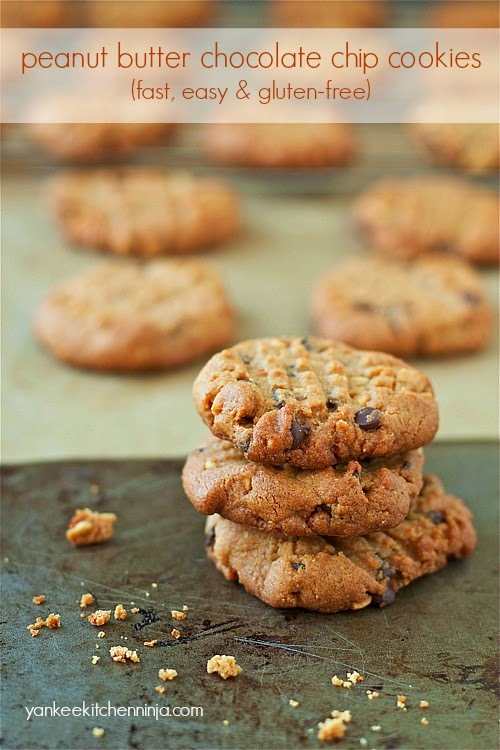 this recipe brings back some childhood nostalgia when peanut butter cookies were a school lunch box staple! thanks for sharing... definitely a recipe i will be recreating. thanks! Peanut butter and chocolate are always what I'm craving! Can't wait to try your GF version of these cookies! Who doesn't love peanut butter?? They look so good right now!! Yummy!! Not kidding -- I hope the Cookie Monstah loves them!